Sometimes it seems impossible to fully conceive environmental space, and the many time scales that extend far beyond that of a single human life. What does it mean to imagine the ever expanding rate of extinction, full absences defined by “critters” I never knew existed, much less imagined. At such times, I simultaneously bump into a limit to my own imagination and the certainty that those limits must break open. 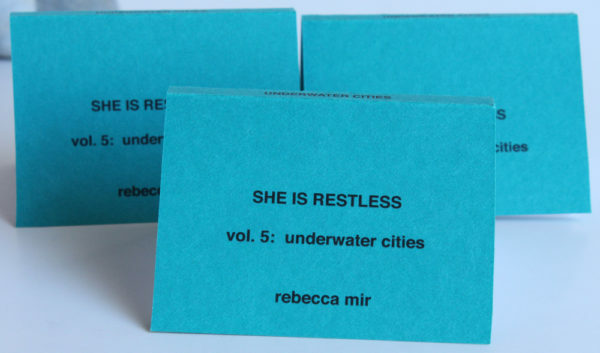 With that in mind, I wanted to tie in an ongoing publication project by Rebecca Mir Grady, an artist, bookmaker, and jeweler based out of Chicago. She has been working on her publication series, SHE IS RESTLESS for about five years. 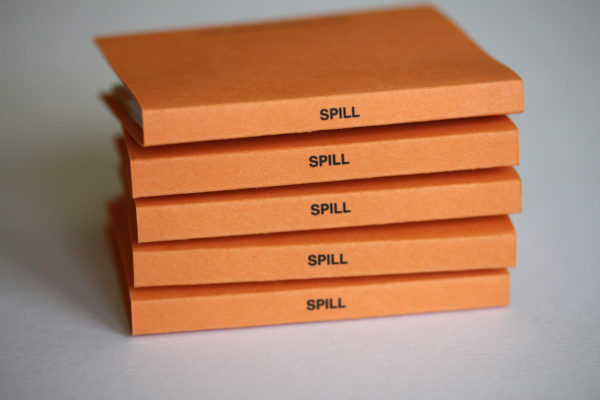 The series is deceptively modest; each palm-sized publication is handmade, each dedicated to one subject: spill, drought, lost at sea, polar vortex, each ecologically minded. 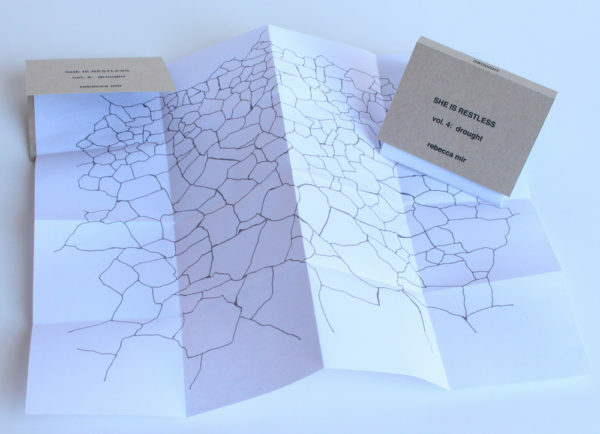 Upon opening one book, a single page folds out, expanding outside the bounds of its cover into a flat, single graphic. The humility of the endeavor, the shifting and interactive experience of scale, and the delicate line drawings each publication contains collude to offer a path towards making-thinking-learning through environmental crisis. You can read a previous interview I conducted with Mir here. Caroline Picard: What made you start to produce this series of publications? Did you always imagine that they would be ecologically-minded? 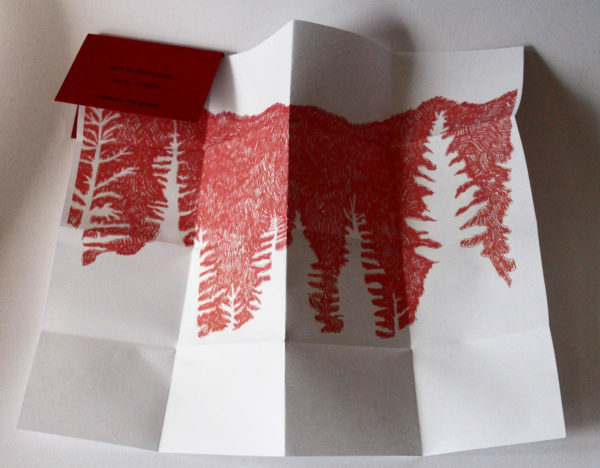 Rebecca Mir Grady: My work is always revolving around nature in one way or another, and our interactions with it—so when I was first planning the series in 2011 to show at Chicago Zine Fest, I only had a vague idea of making something that referenced global warming. (I’d been making a lot of drawings of melting Arctic ice at the time). I was reading Susan Casey’s book The Wave, about giant waves and tsunamis, and their increasing occurrence, when the T?hoku earthquake shook Japan; then came the tsunami, and then the Fukushima Daiichi nuclear disaster. It was difficult to think about anything else besides those events. So, the first two editions “fracture” and “waves” reference the earthquake and tsunami, respectively. CP: What happens when you transform such large events into these palm-sized books? So often conversations around the environment are huge, covering massive time scales, and physical scales, and scales of devastation. One of the things that I love about your series is that it feels exquisitely humble, and even like a good reminder of one’s place within massive events. 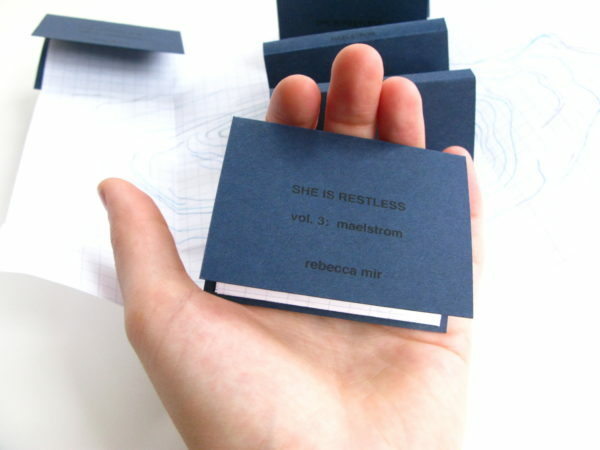 RMG: I’ve always loved books, all kinds, and artist books and zines. 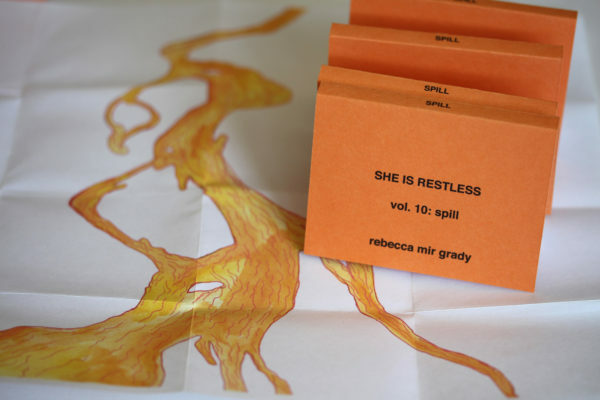 So I think of the SHE IS RESTLESS series as a little bridge between some of the artist books I’ve made in the past and the more zine-like mini comics. One of the great things about zines is that they can be made quickly, cheaply, and efficiently. I self-publish them, so I was able to produce two quick volumes in a short amount of time in direct response to what was happening around the world. But the biggest drawback (for me) with zines is the lack of a spine—I collect zines all of the time, but they quickly disappear into a pile of zines and mini comics on my bookshelf. When I was in Italy, I bought a map of Venice that had a cardstock cover with a spine, which I thought was genius! 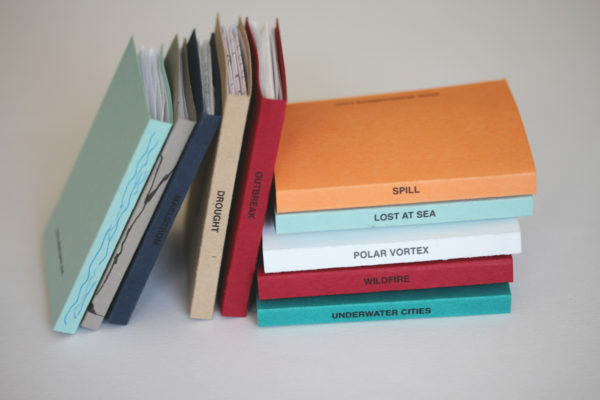 A perfect format to merge the artist book and zine formats. Initially I planned to make some larger ones, but after considering the possibility, it seemed out of place for this project. RMG: The scale of devastation from the earthquake and tsunami was so huge. Looking at pictures and hearing coverage on the radio, it was still so hard to comprehend. I’d also been thinking a lot about scale while reading Casey’s book: How do you describe a hundred foot wave? What about a thousand foot wave? By translating those environmental catastrophes into a book—and a tiny book at that—the scale is exaggerated. Because the book is small, a reader has to get closer to it, to really peer into the subject matter. 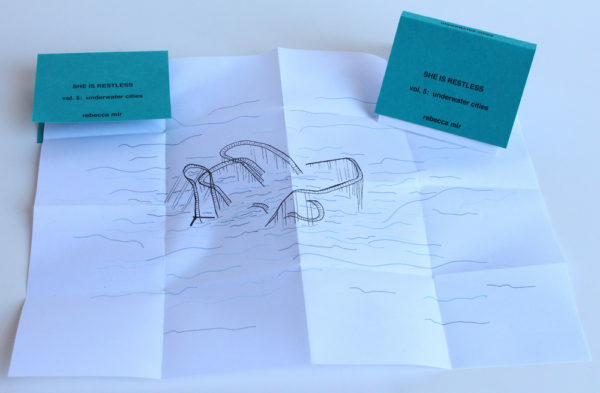 When people pick up the “waves” book, I say, “That is a really big wave.” They open the book, and—by unfolding the map-like page—the wave tumbles out (this one was accordion folded), and seems to go on forever. Then it folds back up, fits in your pocket, and you can take it with you. CP: How did the “Underwater Cities” publication occur to you? RMG: I’ve continued to make one or two editions each year in response to different global warming / climate events / natural disasters that have happened in the year. In that way, I imagine the “SHE” in “SHE IS RESTLESS” as the Earth. The Earth is restless. “Underwater Cities” was made after Hurricane Sandy swept through New York and New Jersey. I saw an image of a boardwalk rollercoaster underwater, and it reminded me of a kid’s sandcastle getting washed away by a wave. Humanity has built so much right on the water; I’m sure that sort of sandcastle effect is going to keep happening with more and more frequency. CP: Is that the only edition with a distinctly human architecture? 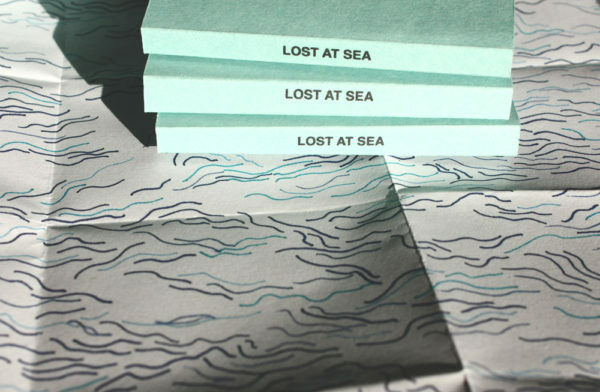 RMG: The “Lost At Sea” edition also directly links to our human presence through its absence. We’re all so connected now, with GPS tracking and whatever else, that it seems impossible to disappear. That made it all the more shocking when Malaysian Airlines flight 370 went missing. CP: Connecting to that idea of absence, I also somehow love that for “Wildfire,” the trees define the negative space, and the rest of the skyline is consumed in red. What made you make that decision? RMG: I made a lot of drawings before I got to the final one for “Wildfire.” This one is definitely one of my favorites—I love the negative space. Visually, it made for a much stronger image than drawing the trees themselves burning, and conceptually it also worked—as some of the trees would be completely consumed by the fire. 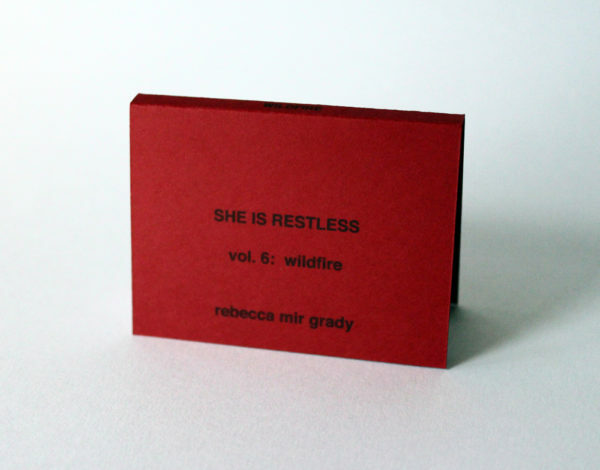 View more of Rebecca Mir Grady’s SHE IS RESTLESS publications here.